Minister of Transportation, Mr. Rotimi Amaechi, yesterday, said All Progressives Congress, APC, government did not promise to fix Nigeria’s problem within a year and cautioned those lamenting the economic hardship to wait till 2019 for the desired change. The ministers spoke in Ilorin, Kwara State, during a North Central town hall meeting for the people of Kogi, Niger and Kwara states by the Federal Government. 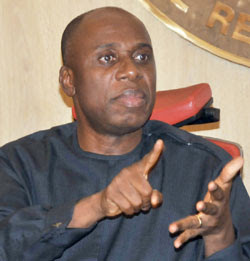 Amaechi, who was the Director General of the Campaign Organisation of President Muhammadu Buhari during the 2015 elections, said though the Federal Government knows that things are difficult, Nigerians should wait till the end of the four-year mandate given to the administration before they can judge whether the government had performed or not.